I have a problem with food. I train after work twice a week at 7 pm and often (too often) I get to the gym a panting, stressed out mess having sprinted there directly from my office, arriving with about 30 seconds to spare. Unfortunately, about 100% of the time I have not made time to eat before my sessions. I have lunch around 1 pm and have jam-packed days and working out 6 hours after eating is plain and simple DUM. My workouts often play out like this: Here I go! Here I go! Heeere I goooo…why am I so tired?…this stinks! ….grrrr!!!!…fail. 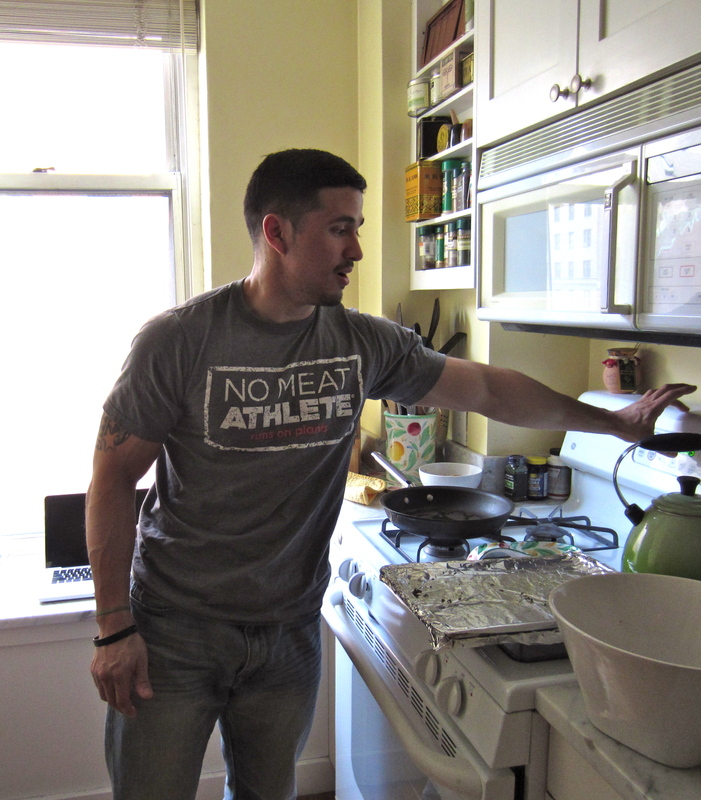 And so, enter my hero, vegan athlete superstar trainer, Tony Soto. 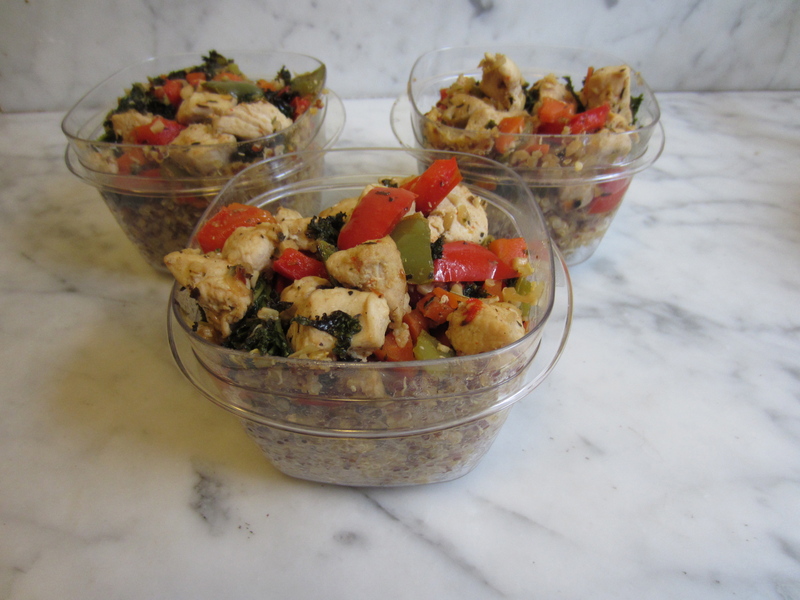 Perhaps it was self-preservation on his part, but he came up with a plan for me to cook healthy meals that are ideal for training and can be prepared in bulk. Let’s turn that frown upside down, shall we? Training is supposed to be fun. 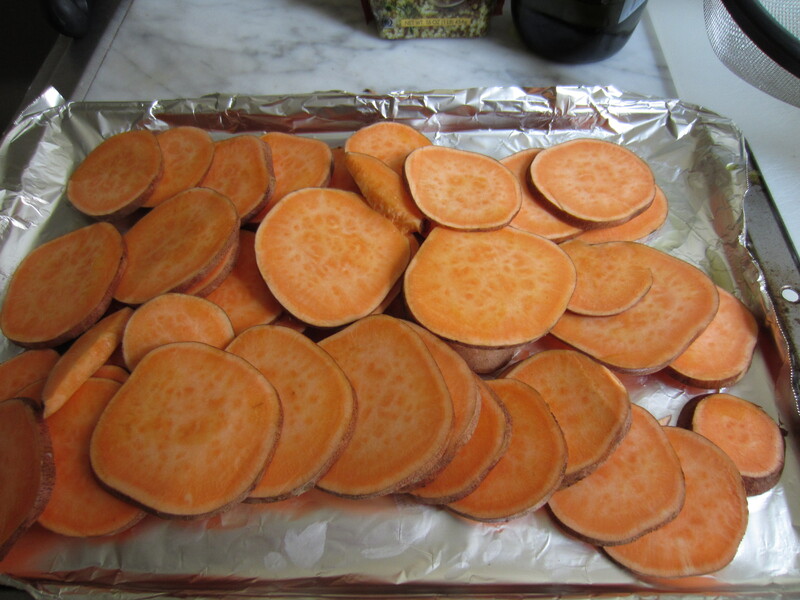 Sweet potato chips with sea salt and a bit of olive oil about to go in the oven to bake. Tony gives my kitchen a workout. Tony came over today armed with groceries and we cooked and cooked. Thanks to him, when the clock strikes 4 pm at work now, I’ll have great, balanced energy-rich meals packed in Tupperware and ready to go so that 3 hours later all will be well in Equinox. Tony and I made kale chips, sweet potato chips, a ton of quinoa (it freezes beautifully), sautéed seiten and a saute of veggies (kale, pepper, onions, carrots, tomatoes) with chicken breast (that was for me – Tony politely declined the chicken.) He even made a chia seed/almond milk mash that doubles as dessert (I’ll post that recipe this week.) Viola – snacks/small meals for DAYS. Look forward to some of these recipes! !